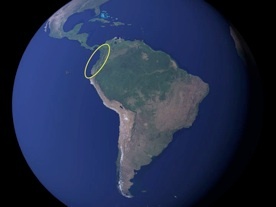 The Chocó contains 100,000 km2 superhumid rainforest in southern Panama, western Colombia and northwestern Ecuador. Running between the Pacific Ocean to the West and the cordillera of the Andes mountains to the East, it receives extraordinary levels of rainfall and humidity. 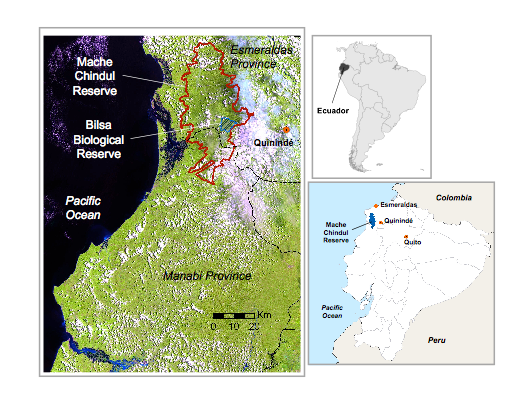 The Andes cordillera and deserts to the South separate the Chocó from the rest of South America. This has led to extreme levels of endemism (when a species occurs only in one area and nowhere else on the planet). This endemism is coupled with exceptional levels of biodiversity and habitat loss by a population with few viable alternatives to habitat destruction. For these reasons, the Chocó is an internationally recognized conservation priority. 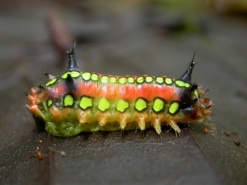 The Ecuadorian Chocó is restricted to the northwestern portion of the country. As one moves southward, the Chocó grades into the drier Tumbasian Biogeographic Zone, which is also extremely rich biologically. Ecuador’s Chocó region is relatively densely populated and has come under strong pressure in recent years from road building and land clearing for agriculture (banana, oil palm, cacao, cattle, and subsistence crops). 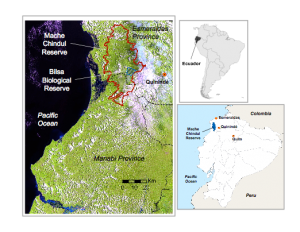 The Ecuadorian Chocó is currently protected by four major reserves which struggle with enforcement because of limited resources. 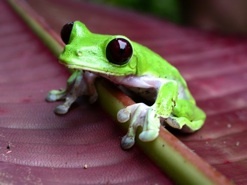 We work throughout the Chocó, but the focus of our efforts is the Mache-Chindul Reserve and surrounding areas. 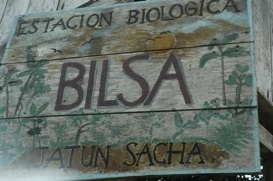 The nucleus of our conservation and research work in Ecuador is the Bilsa Biological Station, run by our partners Jatun Sacha Foundation.